nothing in the console output even relates to X2Pro but you do seem to have some problems with a calendar! Your report probably relates to a specific problem with your XML but it isn't easy to work out with so little information, please create a new post and include the error report text file that X2Pro generated and also your FCPXML and we can take a look at it for you. We are still getting a frustrating unable to parse alert. May I include that here along with the copy of events from Console? Thank you! default	12:18:40.394804 -0800	Notes	0x7fed8f4283c0 - PerformanceMonitor::measurePostBackgroundingMemoryUsage: Process was using 39460864 bytes of memory after becoming non visible. thanks a million. it works at last ! Try re-importing your xml back into FCP X and then trying the whole " right click on the clip and detach audio..." from that xml? Now when you hit detach audio it should then display that empty grey box which you can delete. Sorry I forgot to mention re importing your xml the first time. thx for your answer but on my timeline i don't see that grey area you are mentioning, and that i see on your screenshot. there are several other timelapse shots is the edit but they don't have any audio to start with and i don't see any grey area under the clips in the timeline. We have found a way to work around this FCP problem. The problem is when Final Cut creates your xml it thinks that this clip has audio in it, although there isn't any, so when X2Pro tries to process it, there is nothing there so it gets into a mess. 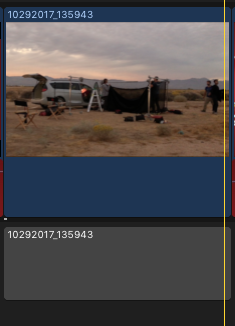 If you open your project in FCP X and right click the problem clip in your timeline [10292017_135943] and click detach audio you will see an empty grey box below the clip (see screenshot). If you delete this grey box then export a new xml, X2Pro will then be able to get past this problem and create an AAF. It is possible there are more clips in your project that have this problem so you might have to do this for more clips. This has been a problem with Final Cut for a while now so we would appreciate it if you would report this to Apple so hopefully they will create a fix soon. Last Edit: 1 year 1 month ago by Daniel Beasley. It seems the session ended as I was talking to one of the developers. He is going to take a look at your xml and the clip X2Pro doesn't like and I will let you know what he finds. i will be on my editing station this morning. i have downloaded team viewer. how do we proceed to get connected and when ?? - Exported AAF from Premiere or go first through Audition and export OMF. Let us know when you have TeamViewer 13 installed and I will send you an email so you can send us the ID and password without it being on the public forum. Then one of us here will connect and see if we can find the problem. where are tou based ? in the US or in europe ? i need to get team viewer and install it. the situation as you may imagine is very scary because by march 16 ,i need to deliver an aaf file of my edit to the sound editor ! is there an alternative to get the sound files to pro tools ?? just for info, i have an earlier sequence dated of january 10 that works when i export an xml file and run it in x2pro audio, i fo get an aaf file ! but i am trying to figure out what happened between that edit and the actual one ! The only way of knowing if the new xml files you made don't have that same bug is if you try putting them through X2Pro. FCP can skip over the issue when you reimport the xml because it won't affect how it works. Besides this, the only other thing that we can suggest here is gaining remote access using something like TeamViewer to see if we spot a problem. it comes up with the same error message and no aaf file created. and i tried with 1.6 and 1.7 versions and same problem. what to do ?? i am stuck and i need to get an aaf file out of this edit. First put the fix.fcpxml into X2Pro and hold shift and click start, does it come up with the same error or does it create an empty aaf? Then open your project in Final Cut and export it as a new xml file. It is worth creating a 1.6 xml and a 1.7xml and putting them both through X2Pro to see if final cut has created a correct xml without any problems.